I have lived in Singapore for the last two years. These two years have been awesome. Back home, when ever I saw white guys or anyone from the Black/ Yellow race, I would refer to them as "Foreigners". The name "Foreigner" sounded so hep then. When the Singaporeans started calling me a foreigner, I liked it in the beginning. I used to think ,"Wow! I am a foreigner too". But when I literally understood the Real Meaning of the term "Foreigner" I realised that it was not a hep term at all. I use the MRT (Metro Rail Transport) system quite often. Travelling in an MRT requires special skills and with my two years of experience in travelling in an MRT, I have become a professional MRT traveller. If you have any plans of visiting Singapore in the future, this post will be of great help (Bane) for you. Just take a look at the picture in the left. Girls are requested not to stare at this picture for more than 5 seconds continuously as it would cause them to fall in love with the protagonist of this post. The creature in the picture is the author of this blog. He is wearing his dirty denim jeans (Check his thigh area). He is wearing this jeans for the last one decade. His hip size has remained the same all these years. When he raised his left hand to catch hold of the hand-grip in the MRT, the passengers to his left side vacated the seat and ran away.He hangs the blue denim jean in his bed room. cockroaches, mosquitoes (any other insects ) never even attempt to come anywhere close to his room because of the denim jeans. Coming back to the topic, The MRT is one place where one can exhibit pole dancing skills. The author of this page has tried his pole dancing skills once and his fellow passengers threw him out of the train. 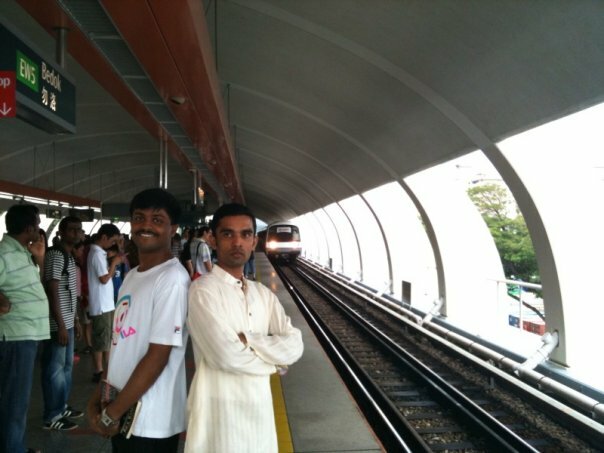 How ever his friend Ravi (name changed) is very popular in Singapore because of his dancing and singing skills on the train. 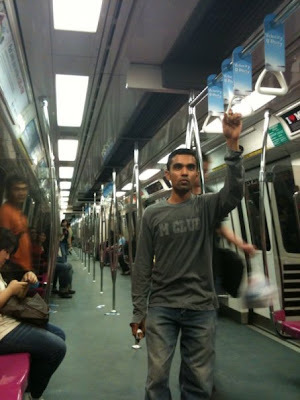 Check this 30 second High-adrenaline pumping action by Ravi in an MRT. Now you would have learnt the art of travelling in an MRT in standing position.I don't have to take classes to teach you how to travel in sitting posture. If there is an empty seat, all you have to do is occupy it before anyone could park their rear end on the seat. You can also pretend to sleep when someone really needy people( Old people/ Pregnant women) search for a seat. Chronicwriter was not successful with this tactic too, because when he tried to fake his sleep, he over acted by creating a snoring sound and he was removed from the seat by the railway authorities. Now, I would teach you the art of waiting for a train. You should wait behind the yellow line. Even if your toe nail crosses the line, an automated sweet voice emerges from the station that says : "Please do not cross the Yellow line". Chronicwriter loves that voice so much and when ever he waits for a train, one can hear the voice more than once. When the below picture was clicked, his toe was on the yellow line and the sweet voice was doing the talking. You can also see the train approaching the station in full speed. After this photograph was taken, Chronicwriter jumped into the tracks and stopped the train with the pinkie (little finger) of his left hand. You might think that he was crazy to do such an act. But by doing so, he saved the life of a puppy dog. The girls in the station clapped at his bravery act. The boys were jealous as usual. Now you have learnt the art of waiting for a train as well as travelling in a train in standing position. Now I am gonna teach the most important art of travelling in an MRT - "The emergency travelling method". This is a dangerous method and it should not be tried by amateurs. This method requires lot of mental balance, precision, timing and emotional stability. On a cold and rainy day, after a sumptuous meal (potatoes, garlic included) when your tummy is full, if you are unable to find a seat in the train and if you don't have any hand grips/ poles to hold on to, you can simply sit on the floor of the train. If you sit in this position, 99 out of 100 times, there would be a strong aroma that would suddenly fill the entire compartment (car) of the MRT. Immediately you should close your nose and point your finger at any random person sitting next to you. You can try these three techniques when you travel by train. Please feel free to share the repercussions in the comments section or in your personal blog after trying these three techniques. Happy travelling. If you have any more doubts on travelling in an MRT, feel free to pop the questions in the comments section. Chronicwriter would consult with an expert team of officials and would answer all the questions in ascending, descending and offending order. good one..the dancer can replace T rajender in tamil cinema..pls write more abt him..
A Hilarious post.. You are too good.. Tomorrow, there is an all India Strike against CommonWealth Selection Committee of India for not selecting Dr.Vijay in the common wealth games. Please accept this as a kind request from DR.Vijay and participate in the strike. thala ipo nanum UK la nadantha underground train sambavatha blog panren :)....... Mind The Gap between the train and the platform :)! I caught you in http://www.vidbite.com/play.php?vid=9084 while searching for Christmas songs. When was this shot?